With Thanksgiving dinner barely digested, thousands of people headed to area malls Friday for the other big holiday tradition – Black Friday shopping. Earlier store openings in Philadelphia, New Jersey and Delaware for the traditional holiday shopping rush appear to be a hit with customers. Starting at 11 p.m., deal-seekers pounded the well-polished floors, looking for anything and everything on sale. "First we started out at Toys-R-Us. Then we made our way over here because of midnight madness. Now we're just waiting for JC Penney's to open up,” said Jessica Petsch of Clayton, New Jersey. Black Friday was in full swing as shoppers took advantage of huge savings at the King of Prussia Mall in Montgomery County. NBC10's Vince Lattanzio reports. 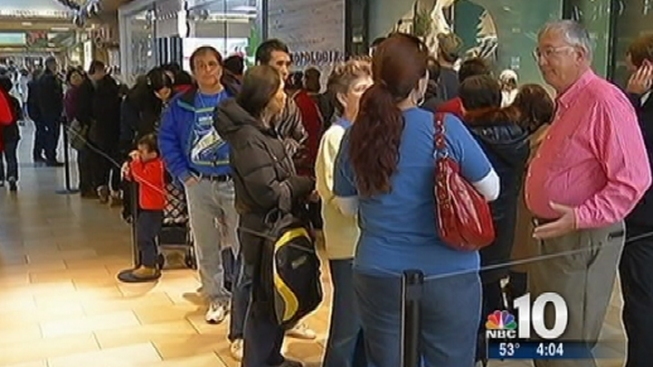 NBC10 was there as thousands of shoppers packed out the King of Prussia Mall as doors opened at midnight. 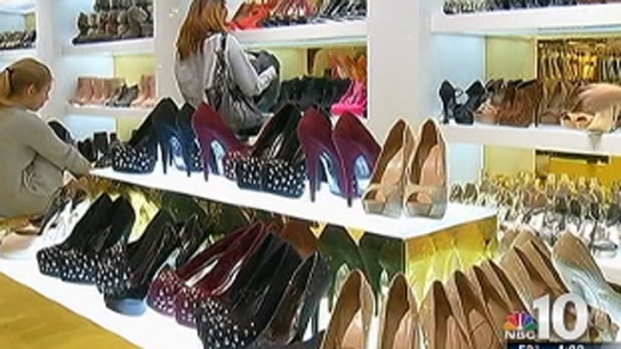 Most retailers offered major discounts as much as 50-percent off many items. Unfortunately some shoppers looking for the best bargains by Friday morning ran out of luck. “I think you had to be here way too early for me to get the good stuff,” said Martina Cade of Aberdeen, Maryland. And shoppers began hitting more than 150 stores at the Deptford Mall in New Jersey at midnight. Shoppers waited in long lines - as long as two hours in some cases - to get deals on high-priced items at a fraction of the cost. 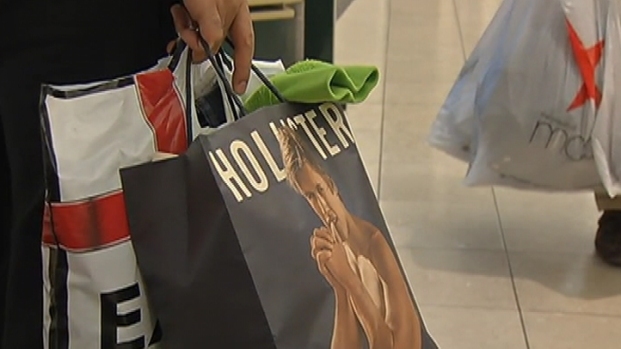 Shoppers hoping for a bargain are out in full-force in Delaware for Black Friday. NBC10 found Daniel Boadrus whipped by the shopping frenzy around 4 a.m.
“My mom is a shop-a-holic along with my cousin, and they're both here. So we've been here since 12, and I'm stuck here until they're done,” Boadrus told NBC10’s Jesse Gary. Shoppers looking for good deals on awesome gifts crowd the stores at the King of Prussia Mall. Executives say despite a sluggish economy, the crowds have grown each year. “The day after Thanksgiving has become as much of a tradition with shopping as it is turkey for Thanksgiving,” said Jim Mackey, Deptford Mall Sr. property manager. The tri-state region saw people walking packages to and from vehicles, and then turning around and heading back for more, in this gender neutral sport now known as "marathon shopping". “I'm actually getting all of my shopping done in a couple of hours. I'm good to go,” said Petsch. 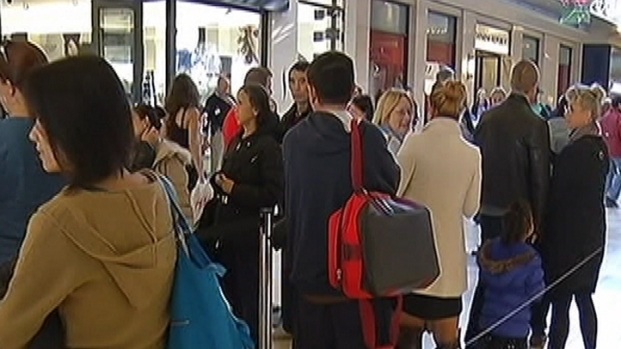 The holiday shopping madness is expected to continue throughout the weekend.